Handles paper weight from 18lb. bond to 90lb. index, 68gsmto 166gsm. Variable speed ranges from 5,000 to 12,000 sheets per hour. Creates seven different fold types: Letter, Z-fold, Half, Double-Parallel, Gate, Engineering and Church fold. Feed table capacity can hold up to 500 sheets of 8 1/2" x 11", 20 lb. bond. 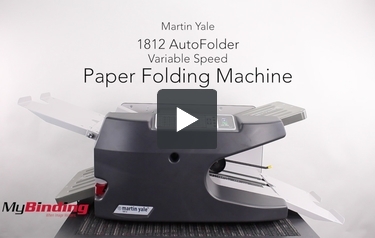 The Martin Yale 1812 AutoFolder paper folding machine speeds up productivity for your business, church, school, or even home use with a variety of features. The 1812 is capable of folding any sheet from 2.5" x 5.2" to 12" x 18" at an adjustable speed range from 5,000 to 12,000 sheets per hour. The 1812 can fold a wide range of paper weights, from 18-lb. bond to 90-lb index without even having to adjust the feed system! This machine will also perform seven different types of folds; letter, z-fold, half, double-parallel, gate, engineering, and church fold. Just simply load your stack of sheets, up to 500 sheets of 8.5" x 11" 20-lb, and let the Martin Yale 1812 do the work while you enjoy the silence of this remarkable machine. Check out the new Martin Yale 1812 AutoFolder and enjoy the pleasures of heightened productivity today. This machine is oversized and will be delivered via truck. As such it cannot be shipped via expedited methods. Standard shipping is dock to dock. If you will require a lift gate or delivery to a residential address additional charges may apply. Folds sheet sizes from 2.5" x 5.2" to 12" x 18". Capable of feeding a wide range of paper weights without having to adjust the feed system - saving time between fold jobs. Fully enclosed manually adjusted fold tables for quieter operation and improved operator safety. Manual set up for fold tables. Dimensions: 43.2" x 22.2" x 17.8"
Welcome to MyBinding video. This is the Martin Yale 1812 AutoFolder Variable Speed Paper Folding Machine. Here’s a start to finish on how to use this machine. Lining up with the back post, insert one of the folding tables to the bottom. It doesn’t matter which table as they’re exactly the same. Then insert the top table and add your paper catcher. Next, adjust your page guides to the correct sized paper that you’re using. Unscrew them slightly from the bottom and adjust from the top. Line up the back with the printed guide. Do this for the other guide. Next, press down on the loading tray until it snaps into its loading position. It’s best to push on the text. Insert your pages. This is slightly more than 500 sheets. Push the red button at the bottom to release the load tray so your pages can be inserted into the machine. Next, adjust the guide wheels to the correct position depending on your paper size and type of fold you are making. Adjust the speed properly. Using the dial on the front, find the letter you need for your type of fold. Here for our first fold, we need it set to M. Using the side with the 1, set the top table to the correct letter. Do not line it up with the knob but with the tabs inside the table. Find your second adjustment and properly set the bottom table. For the bottom we’re using 2 and for this example we’re going to use E. Twist the knob loose and make your adjustment. Now, push test to see if your fold is what you wanted. If your pages are not perfectly straight, try adjusting the skew and running another test until it’s correct. When you’re ready, push run and the machine will fold your pages very quickly until you stop it. The type of folds include the letter fold, Z fold, the half fold, double parallel, the gate fold, engineering and the church fold. But since you can set the fold tables yourself, you can create any custom single or double fold that you want. If you get a paper jam, remove the tool from the back side and twist the bolt in the side hole until your pages come out. And that’s pretty much everything about the Martin Yale 1812 paper folding machine. For more demos, reviews and how-to’s, go to MyBinding.com. If you're looking to speed up productivity with a paper folding machine, look no further. The Martin Yale 1812 AutoFolder offers a variety of features and silent operation perfect for the needs of schools, churches, and other businesses. Quick speeds and a wide range of options make this machine ultra efficient. Here is a closer look at the strengths and weaknesses of the 1812. This device is very easy to use. The automatic friction feed system slides individual sheets into the plates for folding. The fold tables are fully enclosed, providing quieter and safer operation. A reverse switch allows any potential jams to be quickly unclogged. Use is controlled by a smart fold panel. The lit display offers soft touch control with options for various paper sizes and folds, all with the simple push of a button. A wide range of paper weights are accepted by this device without having to adjust the feed system. This will save you time between fold jobs; simply load the tray and go. The feed table can hold up to 500 sheets of 20lb bond paper in letter size. Speed variation offers fold rates that range from 5000 sheets per hour up to 12,000 sheets per hour, depending on paper weight and size. Size of paper accepted runs from 2.5" x 5.2" up to 12" x 18", easily accommodating A4, A5, letter, and legal size documents as well as others. A wide span of paper weights are accepted by this machine, ranging from 18lb bond to 90lb index. This includes the folding of some heavier cardstocks. Seven different standard folds are pre-programmed into this device. They include a "C" or letter fold, "Z" fold, half fold, double parallel, gate fold, engineering or short "Z" fold, and church fold. Within this variety of styles, you can create endless amounts of material, such as flyers, bulletins, newsletters, programs, invoices, correspondence, and menus. Martin Yale provides a one year limited warranty on this product. Although a wide range of paper weights are accepted by this machine, coated and glossy paper are not. Many offices don't use these mediums and won't notice the difference. But businesses that frequently require the use of specialty materials should invest in a machine that can accommodate them, such as the 959AF. This device weighs 102 pounds and will be bulky and awkward to move. If you will need to relocate it often, we suggest storing it on a cart for added mobility and shared use. One thing that would be nice to see is a larger feed tray capacity. Even so, 500 sheets is a generous and normal amount. If you have thousands of papers to fold, be ready to refill the tray every few seconds until your job is done. As you can see from the many strengths, the 1812 is well-suited to accommodate the many folding needs of any office. Simple operation combined with rapid folding provides a convenient way to quickly ready mass mailings or other high quantity send-outs. We think the Martin Yale 1812 is an excellent choice for your next office paper folder. Sheet Size Range Min: 2 1/2" x 5 1/8" Max: 12" x 18" Min: 2 1/2" x 5 1/8" Max: 12" x 18" Min: 4" x 4" Max: 11.75" x 18" Min: 4 3/4" x 5" Max: 8 1/2" x 14" Min: 4 3/4" x 5" Max: 8 1/2" x 14"
Size (W x D x H) 43 1/5" x 22 1/5" x 17 4/5" 43 1/5" x 22 1/5" x 17 4/5" 41" x 19 1/2" x 14" 32 1/2" x 15 1/2" x 13 1/5" 32 1/2" x 15 1/2" x 13 1/5"
Shpg. Wt 105 lbs. 105 lbs 81 lbs. 45lbs. 42 lbs. DO you have a machine that could fold a tiny, thin paper,like a cigarette rolling paper ? Thank you for your question. Unfortunately we do not carry a fold that would be able to work with a piece of stock that is as small and thin as cigarette rolling paper. The smallest dimensions that folders will be able to work with will be in the range of 3.5" x 5" in a 20# stock. what is the returned policy on this item? Thank you for your question. We accept returns for 30 days from when you receive your order (with all original packaging) . You would be responsible for thecost of shipping it back and there is a 10% restocking fee on machines over $500. You can find our complete return policy here .